Militants in ATO zone attack in all sectors, using both heavy weapons and snipers. One Ukrainian soldier was killed in action and six more were wounded, reported Ukrainian Ministry of Defense spokesman on ATO Colonel Oleksandr Motuzyanyk at a press briefing at Ukraine Crisis Media Center. Geography of militants’ combat activity in Donetsk sector remained almost unchanged, expect for the Svitlodarsk area. “South of the Horlivka perimeter was the most intense flashpoint in this sector yesterday. Hostile sniper was active in Novhorodske after midnight,” said the spokesman. In Verkhniotoretske Russian proxies were active in the evening and fired about 30 mortar rounds before midnight. Two shooting attacks took place in Avdiivka. The first one was brief and took place before dawn, militants used mortars. The second lasted for over two hours, involving grenade launchers and machine guns. Shooting attacks in Maiorsk and Pisky were of provocative nature and took place in the afternoon. “Generally, the situation yesterday was calmer than the day before. Militants’ attacks lasted 30-120 minutes each. In total, militants shelled Ukrainian strongholds eight times, which is 2.5 less than the day before,” said Col. Motuzyanyk. 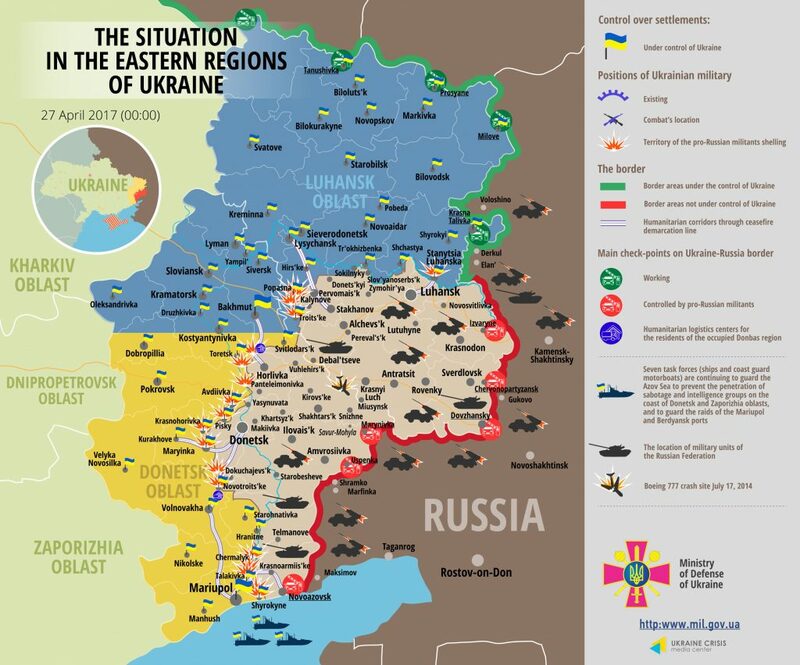 In Luhansk sector main hostilities continued in Popasna district. Militants wereshelling Ukrainian positions near Popasna and in Troitske starting from 14:00 and continued attacking with pauses till the end of the day. “Russian proxies were extensively using mortars, firing over 60 rounds in 24 hours. Their activity peak continued from 17:00 to 19:00,” said Col. Motuzyanyk. Militants violated the ceasefire twice near Stanytsia Luhanska late at night, using light weapons. In total, militants conducted 13 attacks in Luhansk sector yesterday, using mortars six times. The ceasefire held in Novyi Aidar area. In Mariupol sector, in the south, shooting attacks continued with recesses from 10:00 till midnight. Militants continue widely using small arms and ACP weapons. Two mortar attacks took place in Vodiane and Shyrokyne. “In Maryinka district the enemy periodically violated the ceasefire with light weapons, including sniper rifles. Moreover, Russian proxies conducted one mortar attack near Dokuchaievsk. Militants fired five mortar rounds at Berezove defenders in the evening,” said the spokesman. In total, militants conducted 26 attacks in Mariupol sector, using mortars three times. According to Ukrainian military intelligence, three militants were killed by ATO troops’ response fire, and seven more were wounded. Russian side drew up the 64th so-called “humanitarian convoy” at its own discretion. Two columns consisting of 41 vehicles proceeded to Ukraine through Russian checkpoints “Donetsk” and “Matveev Kurgan” in the morning. “The trucks allegedly carry baby food, and one of them – medicines. Number of trucks that crossed the border did not coincide with the number stated in Russian preliminary note. The vehicle with medicines was only 10 % loaded,” informed Col. Motuzyanyk. Report on the military developments as of April 26 is available here. Interactive data on the shelling: chronology shelling chart and the interactive map.